I attended the breakfast with Jesse Jackson this morning, along with Betty Edmondson who testified at the last hearing. Also attending the meeting were Bill Woods of Common Cause, and John Burik of CASE. UC Professor at CCM Electronic Media Dept and minister Robin Riley. Evan Davis from Pacifica was taping the audio. Silbey Arnebeck, Cliff's lovely wife sat at our table. It was nice seeing a few of the OHio Vote 2004 members there as well. Cliff Arnebeck gave a great speech about counting the votes and talked about the lawsuits that he and Jesse were filing on behalf of the plaintiffs in Ohio I will leave you with a portion of what Jesse said that I found remarkable. Veteran civil rights leader Jesse Jackson was in Bond Hill Monday morning urging Tri-state supporters to join him in challenging this month's vote in Ohio. 11/30 -- Attorneys for Green Party presidential candidate David Cobb asked a federal court today to take jurisdiction of, and ultimately dissolve, a temporary restraining order issued by a Delaware County, Ohio judge attempting to prevent Cobb from seeking a recount of the presidential ballots cast in that county. Cobb and Libertarian Michael Badnarik, who are jointly filing the recount demand, are named as defendants, along with their attorneys, in the restraining order sought by the Delaware County prosecuting attorney. The Delaware County judge issued the temporary restraining order without contacting or seeking any input from the candidates or their attorneys. rights to participate in the democratic process. As a candidate, I have a right under Ohio law to demand a recount. If the Delaware County Board of Elections has a problem with that, they need to take it up with the Ohio legislature," said David Cobb. "It makes you wonder if Delaware County has something to hide. Why else would they try to prevent a recount and issue an injunction without giving the candidates any notice to participate?" asked Cobb-LaMarche Media Director Blair Bobier. Cobb and Badnarik initiated the recount demand on November 19 by sending letters and the appropriate bond to each of the election directors of Ohio's 88 counties, requesting a hand count of the votes in every precinct in every county in the state. The total cost of the bond, based on the number of precincts in which a recount is demanded, is $113,600. Sunday, the Reverend Jesse Jackson held a press conference and rally at a Columbus church and announced his support. The Cobb-LaMarche campaign is now in the process of recruiting volunteers and raising funds for monitoring the actual recount process. Volunteers and donors should visit the campaign website, http://www.votecobb.org, for more information. Information about the Green Party can be found at http://www.gp.org. Saturday, December 4th, Symposium, "Stand Up and Be Counted" Columbus, OH. 6:00 P.M. - 9:00 P.M. At Africentric Middle School "Stand Up and Be Counted; A CASE for Democracy" 300 E. Livingston Ave., Columbus, OH. Featuring keynote speaker Rev. Jesse Jackson, author investigative journalist Greg Palast, Rep. John Conyers ( invited), Dean Ian Solomon (Yale U. Law School)(invited), Music/poetry with Gil Scot Heron (invited). (Contact Evan Davis (614) 437-2039 cell (614) 946-3834). New York Daily News columnist: "Ohio tally fit for Ukraine"
New York Daily News columnist writes: "Ohio tally fit for Ukraine"
Reminder - Important Hearing and Meeting Tomorrow Night (Weds. Dec. 1) in Cincinnati!!! Wednesday, December 1st. Vote 2004 - Hearing and Meeting. Cincinnati, OH. 6:00 p.m.-9:00 p.m. Mt. Auburn Baptist Church, 2147 Auburn Avenue, Cincinnati, OH. Vote 2004 Meeting and Taking of Additional Testimony. Contact Juliet Stewart (513)531-9017, email Juliet067@aol.com. All concerned citizens are invited to attend. Replaced by updated calendar. Please check http://fairnessbybeckerman.blogspot.com for more recent version. I haven't used this blog so far to post a review. But the "Election 2004" web site is so extraordinary, I have to mention it. http://shadowbox.i8.com/stolen.htm. Copy it, paste it, use it, and BOOKMARK it. Also, tell your friends about it, even Republican skeptics who have the slightest doubt that a coup d'etat, rather than an election, is what is going on. If you are looking for DETAILED FACTUAL information about the 2004 voter fraud, this web site should be your very first stop. It contains a wealth of valuable information, and links to other valuable information. UA Citizens for Change UpdateGrassroots democracy at its best! We're Back!It's been nearly a month since the UA for Kerry leadership has communicated with our wonderful and committed supporters through our online newsletter, and we apologize for leaving you to cope with the election results on your own. Quite frankly, the wind was knocked out of our sails and it's taken us this long to regroup, recover, recharge -- and refocus.We plan on continuing the group, not as UA for Kerry, but as UA Citizens for Change -- our legal name since August. You will see our name frequently abbreviated as UACC. Shortly we will be changing our e-mail address. We are developing our platform of issues, and brainstorming ideas and directions we want to pursue as a group. We will begin meeting again in January on a monthly basis. We welcome your ideas, and want to know what issues you consider the most important in the coming months. We plan to develop standing committees to provide the larger UACC community with a greater chance for participation, as well as better information and oversight on various concerns such as women's and children's issues; education; the media; and the environment, just to name a few. We are excited about the prospect of being a multi--issue and multi-candidate political action committee.Read this section now! One issue that is front and center is a push for fair, transparent and accurate elections for this past presidential election and for all future elections. All citizens must have equal access to voting and the electoral process in order to ensure our democracy. The backstory: America's election system is badly flawed. So flawed, that a Cal Tech/MIT study of the 2000 Election discovered that as many as one in 18 citizens was disenfranchised due to procedural and/or technological anomalies. The 2004 election was no different! Within hours after the final votes were cast on November 2nd, it became apparent that there were too many irregularities nationwide to ignore. Election officials are saying there are things that go wrong in every election, but how will the situation improve if we are content with mistakes? We can make a difference in safeguarding the electoral process by examining the mistakes that occurred in this past election and helping implement change for future elections. In Warren County, election officials locked the doors to the County building and refused to allow bipartisan observers to watch the vote count. They also denied access to an AP reporter (it is standard procedure for the AP to observe vote-counting in counties all over the country). Other anomalies: double counting in Madison and Sandusky counties; machine misvotes for unintended candidates; confusion about provisional ballots; lost voter registrations; and late or no absentee ballots. Visit http://www.votersunite.org/electionproblems.asp to see a list of additional voting anomalies in Ohio and other states. To hear sworn testimony of concerned citizens from one of four public hearings held throughout the state click on http://www.theneighborhoodnetwork.org/. Several members of the UACC executive committee have been involved since last spring with CASE, an acronym for Citizen's Alliance for Secure Elections, successfully working to keep lawmakers from purchasing electronic voting machines with no paper audit that could be used in a recount. You can get more information at their website: http://www.caseohio.org/. As can be seen by the voting irregularities in Ohio, this year's election in Ohio was deeply flawed. There are many areas, beyond electronic voting, in need of reform. To that end, CASE is sponsoring a "Fight for Democracy, Investigate All 88 Rally," an initiative to draw attention to problems in our electoral system and to support the Congressional probe of allegations into voting irregularities in Ohio and elsewhere. (See flier copied below.) Thousands of people are needed to attend the rally to show Ohio election officials, lawmakers and the nation that we believe every voter counts and every vote must be counted, and that election systems need to be corrected to insure that our most precious right as citizens -- choosing our leaders through a tamper-free, transparent, verifiable voting process -- is developed and protected. At stake is the very heart and soul of our democracy. Make sure your voice is heard loud and clear in future voting booths -- by voicing it loud and clear on Saturday! Hope to see you there! has been dismissed or underreported by the mainstream media. election was a huge success, saying, "We came through with flying colors." We need thousands of people to attend the"Fight for Democracy Rally"
support the Congressional probe of allegations of irregularities in the November 2nd presidential vote. was disenfranchised due to procedural and/or technological anomalies. to voting and the electoral process in order to ensure our democracy! "Stand Up and Be Counted; A CASE for Democracy"
Africentric Middle School, 300 E. Livingston Ave., Columbus, OH. Click on the links below to find out more. * CLICK THIS LINK to view the web version of this information and to download a flyer for distribution. Associated Press: "Nearly a Month Later, Ohio Fight Goes On"
rally scheduled for Columbus on Dec 4th. 300 E. Livingston Ave. Featuring Rev. Jesse Jackson, Greg Palast, Rep. John Conyers (invited), Music/poetry with Gil Scot Heron (invited). It's a busy time as plans to mobilize people to Ohio for rallies and recounts are being finalized! Thank you for continuing to organize in your communities to help get the word out about concerns with election fraud and disenfranchisement of minority voters in Election 2004. For those of you traveling to the December 4 rally in Columbus, Ohio, please take the time to read the cautionary notes below. Check out the website (www.donotconcede.com/CoalitionNews.html ) for a list of additional actions you can take that will make a difference. For those of you not traveling to Ohio, we urge you to organize events at your statehouses on December 4 in support of a FAIR VOTE that will help raise awareness of our concerns nationwide. 12/01 Date by which most Ohio counties will have certified their initial vote totals. 12/07 The "safe harbor" date by which presidential electors in all 50 states must be conclusively determined. certification of the state vote. Ohio and all other states. several lawsuits, a Congressional investigation and the outcry of voters rights groups, this fact has been dismissed or underreported by the mainstream media. Even Secretary of State, Kenneth Blackwell, indicated the Ohio election was a huge success, saying, "We came through with flying colors." Please plan to attend and bring your friends! America's election system is badly flawed. So flawed, that a Cal Tech/MIT study of the 2000 Election discovered that as many as one in 18 citizens was disenfranchised due to procedural and/or technological anomalies. The 2004 election was no different! All citizens must have equal access to voting and the electoral process in order to ensure our democracy! Download the attachment and click on the links below to find out more. * CLICK THIS LINK to view the web version of this information and to download a flyer for distribution. * CLICK THIS LINK to get an overview of 2004 election problems. piping less than 1/2 inch in diameter. interaction with law enforcement officials. of civil disobedience at this event. The following news items are included in a press kit presented to the media this morning at 11:00 am in a demonstration at KGO TV, 900 Front St. San Francisco. The demonstration is to protest the corporate newsmedia blackout on widespread reports of felony election fraud and voter suppression. Following the KGO demonstration, we will march to the office of Sen. Barbara Boxer, at 1700 Montgomery St. San Francisco. to stand with members of the House of Representatives in challenging the Electoral College votes resulting from this mockery of an election. “The right of voting for representatives is the primary right by which all other rights are protected. A wide-ranging overview of red-flag voting machine abnormalities and voter suppression reports from Florida, Ohio, and across the nation, election recounts and lawsuits, and background on blackbox corporate lineage, HAVA legislation, and voting machine hacking vulnerabilities. Reveals collusion between National Election Pool and TV networks in late-night falsifying of original exit poll numbers to cover up the late, sudden, and statistically impossible “red shift” surge of tallied votes that reversed Kerry’s lead and swung the election to Bush. Jonathan Simon examined exit poll anomalies defying probability across all states, noting that in 12 swing states the average shift to Bush was 5%, twice the rate of exit poll disparity in noncritical states. The Dopp study of Florida vote patterns found the Bush vote skewed an average +128% above the statistically expected count and the Kerry vote depressed -21% throughout the state among counties using optical scan voting machines. Reporting from Ohio, detailing how Republican election officials suppressed untold thousands of urban Democratic votes, through contrived voting machine shortages, provisional ballot challenges, switching of poll locations, late mailing and rejection of absentee ballots, and other systematic violations of the Voting Rights Act. Home of the election fraud whistleblower organization, currently filing the largest FOIA request in history to audit the logs and tapes of 3000 voting precincts. See the Breaking News section for a listing of current BBV investigations, including the Volusia County FL raid that caught election officials destroying original voter tapes and substituting forgeries. Computer security expert demonstrates how ridiculously easy it is to hack the vote on a Diebold central tabulator. Herrin provides downloadable Diebold GEMS software and a step-by-step screenshot tutorial showing how anyone with a Windows computer and elemental knowledge of a simple spreadsheet can redo the numbers for an entire county in one undetectable maneuver. Keith Olbermann, MSNBC, has been on this story from the beginning. Roll back in his online blog Countdown to get the full history since Nov. 2. The website verifiedvoting.org provides a powerful tool for researching voting technologies and procedures in effect in every precinct in the U.S. Click on a state or a county and find out what kinds of voting machines and tabulators are used there, whether early, absentee or other special voting procedures are available, and whether a verifiable audit trail is required. Story hint: Sequoia Systems. As an auditor experienced in uncovering complex financial corruption, Drobny says “statisticians can show with great credibility the probability of manipulation within the computer programs used for counting the ballots. They do this kind of work all the time to uncover fraud based upon computer manipulation in commercial and corporate activities. And these types of expert analyses are admissible in a court of law.” Drobny proposes a large-scale, rapid and well-funded auditing campaign to demonstrate the fraud behind the 2004 election. ReDefeatBush.com brings together Democrats to register voters by phone and mail in key battleground states. "We beat him once, we'll beat him again"
Demonstration Thursday, December 2nd -- Rochester, NY! Several Rochester residents who witnessed electoral fraud in Ohio and Florida have stepped forward to testify at the demonstration this Thursday. Did you see something? Do you know of someone who lives in this area who did see something? Please contact the Metro Justice office at 325-2560. We have to get the word out. Activist organizations all around the country are shining a spotlight on this issue. We can't stand idly by while the D&C sits on this story. electoral fraud in the 2004 election. hacked? Where is the feature article about Louise Slaughter's request to the GAO to investigate the election? IT IS TIME FOR THE DEMOCRAT AND CHRONICLE TO DO ITS JOB! Friday, December 3rd. Protest Against Media Blackout. Los Angeles, CA. 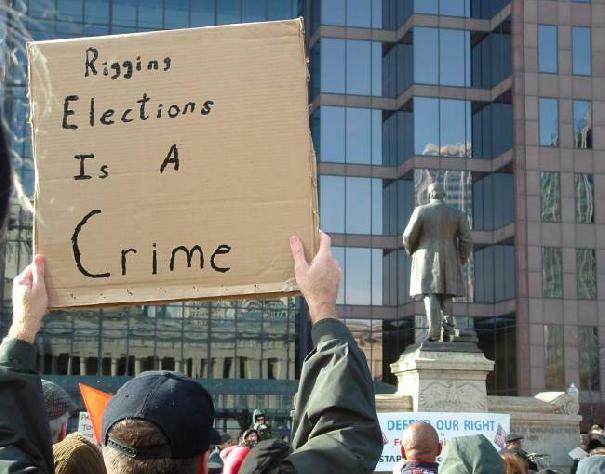 Protest of Media Blackout of Election Fraud in Ohio and other states. Friday, December 3rd. Protest. Los Angeles, CA. 3:30-6:00 p.m., 6121 Sunset Blvd., Los Angeles, outside KCBS-TV/KNX News. Saturday, December 4th, Symposium, "Stand Up and Be Counted" Columbus, OH. 6:00 P.M. - 9:00 P.M. At Africentric Middle School "Stand Up and Be Counted; A CASE for Democracy" 300 E. Livingston Ave., Columbus, OH. Featuring keynote speaker Rev. Jesse Jackson, author investigative journalist Greg Palast, Rep. John Conyers ( invited), Music/poetry with Gil Scot Heron (invited). (Contact Evan Davis (614) 437-2039 cell (614) 946-3834). December 11, 2004, March on Washington. Nationwide - Washington, DC. (Call (561) - 889 - 2165 or email activistdemocrat1@yahoo.com to participate with the "March on Washington D.C." on Dec.11, 2004. This is the day before the Electoral College votes to decide who will be representing the United States as either the 43rd or 44th President of the United States. Saturday, December 18th Protest, New York, NY. Jackson has demanded Blackwell recuse himself, saying "the owner of the team can't also be the referee." A broad-based legal team--now including Jackson's PUSH/Rainbow Coalition as Plaintiff--it preparing to file an election challenge asking the election results be overturned. Jackson says computer forensic experts must be given full access to electronic voting machines that have provided no paper trail, but which could be electronically analyzed from within. Jackson said he has spoken with Democratic candidate John Kerry, who indicated his support for the recount process. New findings indicate that Kerry's margins in 37 (of 88) Ohio counties are suspiciously low when compared to those garnered by Judge Ellen Connally, an unsuccessful Democratic Supreme Court candidate. The calculations focus on standardized county-wide ratios between bottom-of-the-ticket tallies won by Judge Connally versus those won by Kerry in heavily Republican, rural counties. According to a wide range of experts, there appears to be a systematic removals of Kerry votes by hackers who overlooked the Connally votes, which now clearly infers something went wrong. "It's simply not credible that a vastly underfunded African-American female candidate at the bottom of the ticket could outpoll John Kerry in Butler County," said Cliff Arneback, a lead attorney for the challenging legal team. Jackson said the situation "does not pass the smell test." We are going to have a meeting here in Cincinnati at the Mt. Auburn Baptist Church on Wednesday evening from 6-9pm. We will follow up with more testimonials of voter oppression, and updates on what is happening here and in surrounding counties. Also,discussion on the rally scheduled for Columbus on Dec 4th. We will also be discussing any other Voting issues that need to be addressed. For those who have missed the previous meetings hope you can attend this one. DAYTON Sen. John Kerry extended his winning margin slightly inMontgomery County in official results Monday at the Montgomery County Boardof Elections.Board staff on Monday conducted a full, official count of the MontgomeryCounty votes from Nov. 2.The results showed Kerry's margin in Montgomery County grew by 1,070 votes— to 4,616 — over President Bush.The official count did not change the ultimate result of any issues on the ballot, according to board Director Chris Heizer. The official results are expected to be adopted at the meeting of the boardof elections today.The official count included 7,375 provisional ballots that were cast Nov. 2 but set aside until board staff could check the voter's registration orresidency. Overall, there were 9,257 provisional ballots cast in Montgomery County,and 1,882 were ruled invalid.Of the 9,257 provisionals, 11.5 percent were ruled invalid because thevoter was not registered, and 8 percent were ruled invalid because thevoter was in the wrong precinct, elections officials said. Democrats had sought before the election to have Ohio count all votes byregistered voters regardless of whether the voter was in the correctprecinct. But Ohio Secretary of State J. Kenneth Blackwell prevailed in hisinterpretation of Ohio law that requires voters to vote only in their homeprecinct.The official count Monday also helped erase an unusually high number ofso-called undercounted presidential votes in several Montgomery Countyprecincts, including Washington Twp. X and Kettering 3-A, where more than25 percent of the ballots initially registered no vote for president. Officials said electrical service to three of nine vote-counting machineswas interrupted election night when a fuse blew, then backup batteries died.The precincts that were being counted when the power died were recounted,but the interruption also affected results that were being transmitted tothe central computer.Board staff did not know those were lost until media accounts found thehigh discrepancies, Heizer said.In the official count Monday, Washington X and Kettering 3-A hadundercounts about 2 percent each. The error meant 186 votes for Bush and 106 votes for Kerry were not countedbetween the two precincts. >br>Boards of elections across the state have until Dec. 1 to complete their official count of the Nov. 2 election results. Jesse Jackson: "the Ohio Supreme Court should consider setting aside Bush's win in Ohio"
"The Rev. Jesse Jackson said Sunday that the Ohio Supreme Court should consider setting aside Bush's win in Ohio ..."
8:30 a.m. Rally against vote suppression and fraud in Ohio vote elections. Integrity Hall, 2081 Seymour Ave., Bond Hill. This file has been replaced by more recently updated Calendar of Upcoming Events. Please check http://www.fairnessbybeckerman.blogspot.com for latest version. Associated Press : "Jackson Joins Critics of Ohio Vote"
Chicago Sun Times: "Jackson Rallies for Ohio Vote Probe"
Chicago Sun Times : "Jackson Rallies for Ohio Vote Probe"
Jesse Jackson: "Mr. Blackwell cannot be both the owner of the team and the umpire." "We need to investigate, coordinate, litigate, recount and recuse," he said, referring to the legitimacy of the Ohio vote. “Mr. Blackwell cannot be both the owner of the team and the umpire.” "
For those of you traveling to the December 4 rally in Columbus, Ohio, please take the time to read the cautionary notes below. Check out the website (www.donotconcede.com/CoalitionNews.html) for a list of additional actions you can take that will make a difference. America’s election system is badly flawed. So flawed, that a Cal Tech/MIT study of the 2000 Election discovered that as many as one in 18 citizens was disenfranchised due to procedural and/or technological anomalies. The 2004 election was no different! All citizens must have equal access to voting and the electoral process in order to ensure our democracy! Subject: The Ohio Recount is moving forward! The Ohio Recount is moving forward! Green Party to take a stand. donations to pay for the effort. asking them to prepare for the recount. with volunteers on the ground. prior to the December 7th "safe harbor"
is granted by the judge. not have any electors anyway. have certified their initial vote totals. a rally to "Investigate all 88." help, democracy will be served. this email to your friends and family! DISCLAIMER: Views and opinions are those of the individuals. San Francisco Actions Tomorrow, Monday, November 29th, 11 am & 12 noon. from a variety of different organizations and citizens groups! Vallejo, turning left onto Vallejo. Turn right onto Front Street. Suggestion: might want to wear black, black armbands, or black ribbons. make a lot of joyful democratic noise! - Minimum standards in the voting procedure throughout the US. - An auditable paper trail for electronic and all voting machines. ensure fair and accountable elections. of the tens of thousands of reported complaints regarding the 2004 election. non-partisan effort to ensure that every vote is counted. counting provisional votes on all 88 counties. Let me begin by saying I voted for you. fairly and to independently look into the matter. ask is all they need to achieve such a request. that democracy is suffering terribly if not critically. for your ideas and values. You are in a SAFE state among people who share many of your beliefs. possibility of FRAUD and vote fixing. votes cast via electronic voting machines. the past year and a half. grassroots level if you take this on. You could revolutionize the argument. when doing this that cheating wasn't going to happen on his watch. other parts of the country? the courage and do what you do so well. U.S.A. can pass one more law or engage in one more battle. Only one Senator is required ... it would make us all proud if you were first. Where: Mt Herman Missionary Baptist Church, 2283 Sunbury Road, Columbus, Ohio. ALL CONCERNED CITIZENS ARE INVITED TO ATTEND!!!! This calendar has been replaced by updated version. Please check http://www.fairnessbybeckerman.blogspot.com for updated calendar. Protest to Demand Recount, Delaware, OH, Mon. Nov. 29thth, 11:00 a.m.
WHY DOES THE DELAWARE COUNTY BOARD OF ELECTIONS FEAR THE TRUTH ?? What: Peaceful, Patriotic Protest - Demanding a Vote Recount inDelaware County. Directions: From Columbus, go north on State Route 23. Get off onSandusky Street exit and go north into town. It is approx. 1½milesdown the road. You will pass Rt. 36 and Rt. 37. It will be in theblock following Rt. 37. When: Monday November 29th 2004 at 11:00 a.m.
What to bring: Appropriate clothing to be outside for awhile, signs,bullhorns for sound amplification, drums, and whatever else you feelwill help you express your feelings. Why: Paddy Shaffer: "It is time for Delaware County to begin to recount the results of the November 2004 election. They do not plan to do it. We need to demand that the recount happens, and soon in Delaware County. If our vote in Delaware is not recounted, other counties are looking to stop the recount also. The election results could still change. Here is the story… Federal Judge James G. Carr in Toledo ruled that Ohio law gives the candidates the right to a recount, but the judge says it can wait. Delaware County Common Pleas Judge W. Duncan Whitney granted a temporary restraining order on Nov. 23, 2004 to block a recount to the Nov. 2, 2004 presidential election. They are seekingto make this a permanent restraining order. If they succeed, we will be prevented from knowing what the true vote is and what reallyhappened on election day. Official results of the election are to be certified by Dec. 6,2004. Electors for the Electoral College are to be certified by Dec.7. The recount needs to begin NOW, so it is finished on time. Thepermanent restraining order Delaware County seeks will prevent arecount from ever happening for the 2004 election, even if the stateorders it because the final count is close. The Delaware County Board of Elections is using CountyProsecutor David Yost as their legal advisor. He was quoted in theColumbus Dispatch saying, "to ask taxpayers to fund someone's political hobbyhorse when there is no possible chance of a different outcome seems to be an utter waste. There are better uses for that money in Delaware County and, I suspect, in other places around the state". He didn't know what it would cost, but said it would be substantial. To understand what happened in the Florida 2000 election, I recommend the movie titled "Unprecedented". To movequickly on the election results is very important. If the Florida votes had been counted quicker, Gore just might be our president today. The Bush Administration has requested that the UkrainianGovernment not certify the results of their very recent disputed presidential election. They are asking that they wait until athorough investigation of broad irregularities and voter suppressionis resolved and the true count determined. Don't we deserve the same respect for the integrity of our vote in Ohio (and some of the other states also) that the United States is demanding of Ukraine. Two Public Hearings were held in Franklin County onNov. 13 and 15 on the widespread voter suppression and vote irregularities in Ohio. Over 500 attended, and sworn affidavits were taken by approximately 200 concerned voters. Stories are still being collected on the problems of the Nov. 2 election. Check out this site for more information on the Public Hearings…http://www.freepress.org/departments/display/19/2004/886 Questions to Ask: 1. If David Yost is so confident of their procedures, why doesn't he want it verified? Particularly when it is such a close election,with the whole world watching – we deserve better.2. "Political Hobbyhorse". This comment is insulting to thousands ofOhioans that are concerned with and acting to protect our democratic elections.3. David Yost thinks there are better uses for the money than a recount. What could be a better use of the money than to get the results counted and made public of who, and for what, the people ofDelaware voted . Maybe these results won't change, but what if they do? If they claim poverty, what would they do if the state had an automatic recount, which we are very close to? So besides thecandidates asking for the recount, when the certified results are turned in, we may be close enough for an automatic recount by thestate. If Delaware County gets the permanent injunction, they will not recount whether the candidate or the state wants it.The Libertarian and Green Parties paid the amount of $113,600.00 for the recount. The Democratic Party and many other voting rights organizations endorsed this. This is the amount required for a recount. Yost should follow through and do what is required of his county, Delaware County. The Delaware County Board of Elections should be working in a nonpartisan manner. Does Delaware County have something to hide? If not, why do they fear the recount? Lets have Delaware County come clean on the Election so we don't become the laughing stock of the nation, like Florida did in the 2000 election. Does Delaware County want to be the brunt of Letterman and Leno's jokes for years to come? A recount is a good idea in an election with problems, and that is what has happened with this 2004 Presidential Election. What else can you do? Letters to the Editor, to Congress, to the Senate, contact the media, talk to neighbors, talk to and write your elected officials. Get Delaware to count the votes NOW! Donate to blackbox.org to help with the election audit. Share the below sites with others. Invite others to join us Monday. Spread the word. The election issues need resolved NOW, not in four years. If you have questions contact Paddy Shaffer at paddy@columbus.rr.com or at (614) 761-0621. " legitimacy of the Ohio vote. the seventh game of the World Series," Jackson said. individuals and organizations calling for a recount.